This is an absolutely gorgeous piece of art...the detail is lovely and the carving carefully crafted. Color is absolutely perfect against my terra cotta walls, and this package came so quickly. Love these elephants ! Add a rich look to your wall with this hand-carved wall art hanging. This exquisite piece features two elephants with their trunks in the air amid intricate cut-outs and scrollwork. Hang this stylish piece wherever you want to add a natural element to your space. The piece is crafted from teak wood and given a teak finish for long-lasting beauty. Thanat has been drawing inspiration from the rich cultural heritage of his homeland to express his artistic talents for nearly ten years. He has a small workshop in Northern Thailand, where he and other family members practice their craftsmanship. At his workshop, only manual tools are used which helps achieve finely detailed work and artistry. This is a nice piece but it's also a bit rough in terms of its finish. More quirky than elegant in reality, but still fulfills a vibe. It's suited to a rough decor (like a sunroom) more than an elegant feel. I love wood carvings and I love elephants. 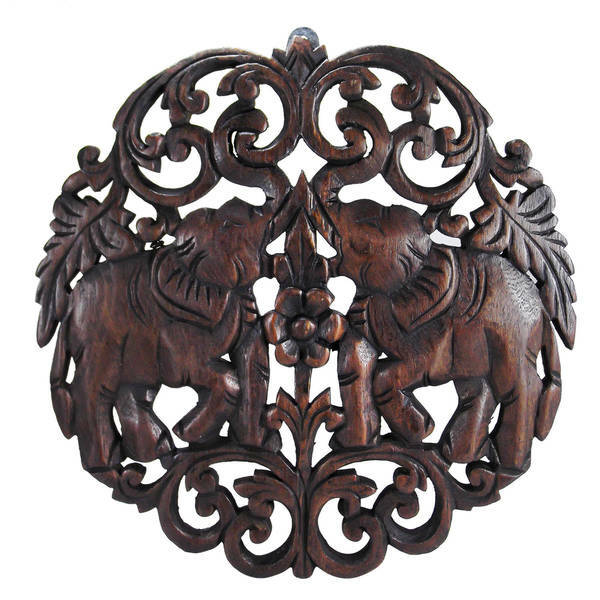 This is a nicely carved wooden elephant(s) piece in a rich dark brown color. We have this on an accent wall in our guest room/office that is decorated in this world decor style. Highly recommend. The piece is rough and obviously not hand carved. Stain was fresh and not rubbed down so it came off on my hands when I unwrapped it. The two elephants coming together is very cool and fit in with my other wood hangings. It is beautiful. This is beautiful! The details are excellent, this will look very nice against the tan walls in my kitchen. I would defiantly buy again. Nice well made decorative piece. Relatively lightweight. Bought as a holiday gift for a friend. I like the fact that it is handcrafted by an indigenous Thai artisan. It is artwork to enjoy for a lifetime. I bought this, because it was a handmade. Little disappointed. It was too small on the wall and elephants doesn’t really stand out. We love Thai art so this was prefect in our kitchen. Very nicely made. I love elephant and this goes great with my collection,hang this at the top of my stairs.got a lot of compliments on it. it was real nice, but would have better if it had a finish on it. This was a nice piece but didn't resonate with me in person as much as it did online. There was also a strong oil smell. Really nice for the price! This really is nice for the price! A gift for a Elephant lover..